The war on buses is continuing. 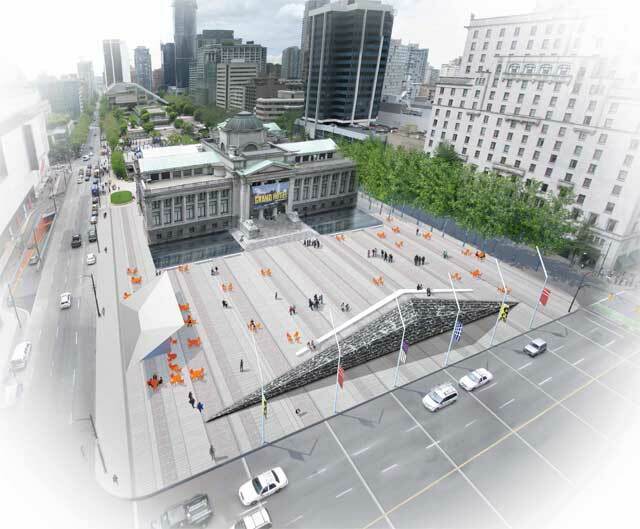 The site analysis, while showing permanent bus stops on Burrard, and temporary ones on Howe, fails to show a single bus stop on either Robson or Granville. Also surprising is the lack of mention of any major transit corridors in the vicinity (Granville is not considered as such!). That could be due more to ignorance of the site and unfamiliarity of the bus network by the design team, than malevolent intentions. Nevertheless, the result is still a deceptive material, raising questions on the openness and good faith of the city of Vancouver in regard of the Down Town bus service review. 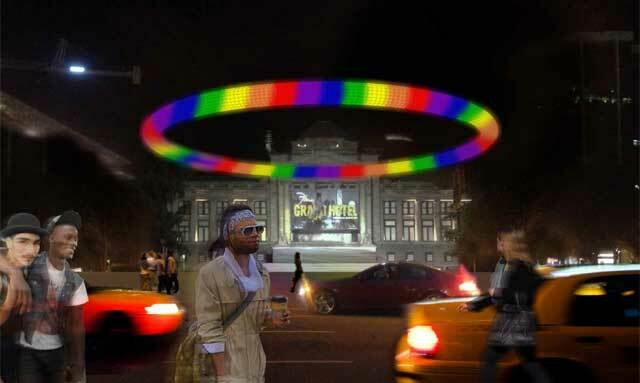 A Plalo Ring, transforming the square as a night club at night? 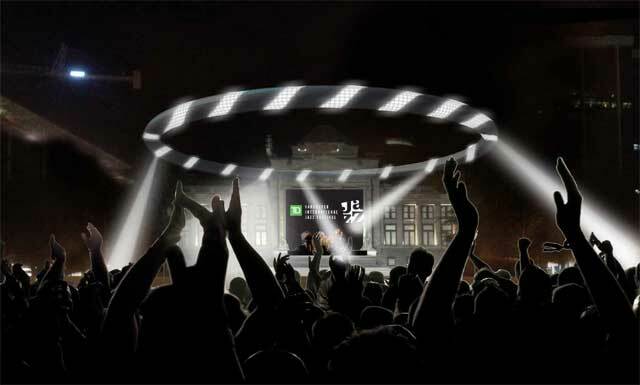 May be for a “Nuit blanche” event, but permanently? The focal point of the square is obviously the Rattenbury building, and any design should be driven at making the best of this heritage building. This Plalo ring, not only ignoring the Rattenbury building, but also diminishing it, is probably out of place on the North Plaza. One could also infer, it could create some problem for some events. (lighting issue, and sound reverberation). Someday, they will propose to demolish the Rattenbury building to increase the size of the north Plaza! Some “edge” on the side of the square? The fountain along Georgia, seems more inspired by the current “centennial fountain” than anything else. As much as the current fountain, it creates a psychological barrier to the Rattenbury building access. 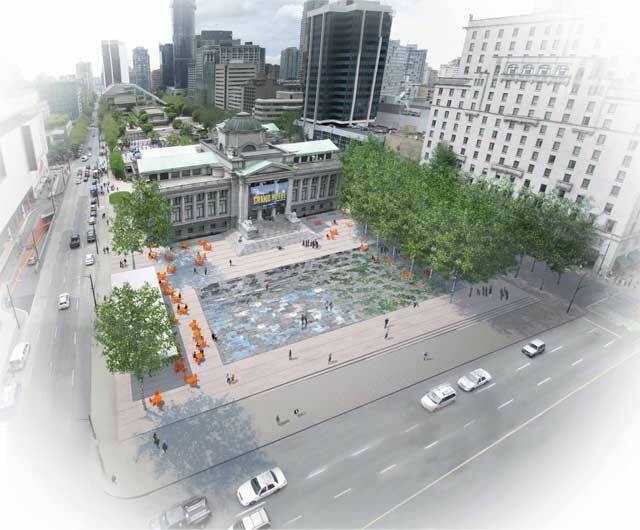 It is worth to note, that a fountain used to sit along Georgia (and is now along Hornby: it is also surprisingly missing of the site inventory). Why not restore the historic fountain in its original location? The site inventory notice a bus stop at the foot of Howe street, so this design turns its back on Howe, and erect a “wall” there, preventing the transit users to be part of the square life…enough is said! Does the water mirror, need to cover all the square? Does the water mirror, is a necessary feature on the North Plaza? 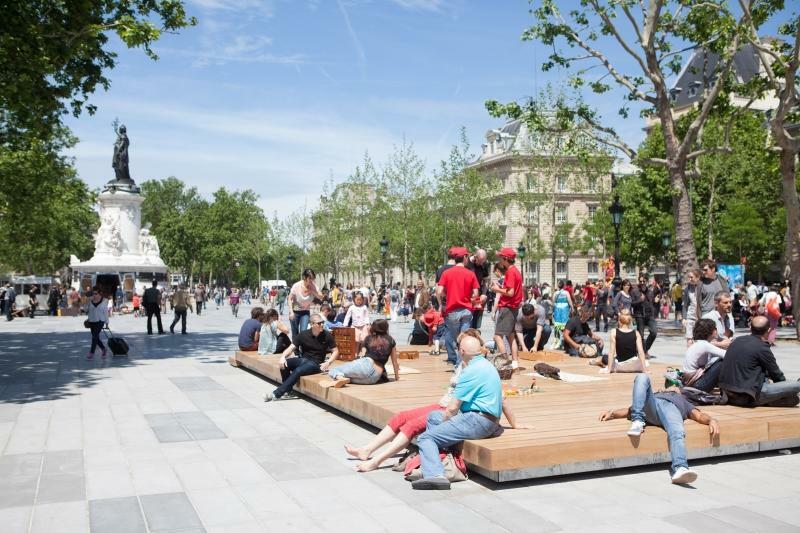 may be, may be not: the square is somewhat small, and a proper surface treatment and other urban furnishings, can be enough, to both compliment the building, and enlivening the square. Place de la Republique, Paris: a skateboard ledge? a speaker corner? a mattress? Basic, moveable furnishing, can gather many spontaenous uses, enlivening the square at low cost. All presented proposals seem to be relatively weak, focusing more at addressing the need of a 3 days Jazz festival, rather than addressing the place itself. As such they are relatively uninspiring, especially when compared to the “red carpet” as presented by Hapa collaborative, at the “Where’s the square?”, VPSN design competition. All design are based on “Hard landscaping” landscaping because it is “more durable and long lasting”: If Granville mall, where the city believes an outstanding job has been done, is an indication, one should not hold his breath on it. Since, the setting could be temporary, the city could be well inspired to use a compacted fine gravel surface, which has the merit to be much cheaper than a good quality hard surface, and easy to recycle, whenever a new arrangement of the square is required by a different use of the Rattenbury building. 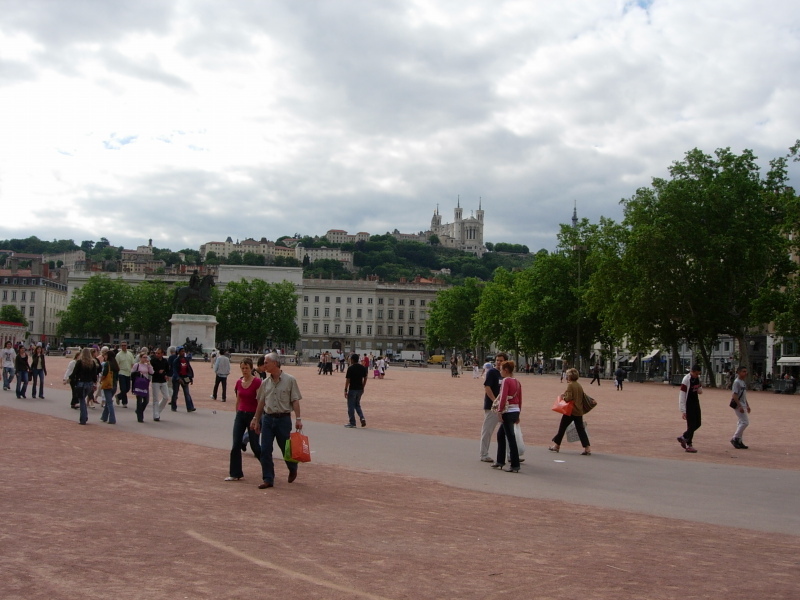 Like many square in France, Place Bellecour, Lyon, has a compacted surface, able to accomodate a great range of venue. And why not also keep the space as a blank page?… pretty much like Place Bellecour in Lyon, France, which Viva, or other group could program (instead of organizing a blockade on bus routes), and revisit our options when we will have more clarity on the future use of the Rattenbury building? see “block 51” public consultation, which has left a sour taste with many observers, as we have already noticed here and there. In despite of all evidences, VPSN, a group advocating for aggressive pedestrianism and co-organizeer of the block 51 consultation, unsurprinsingly and sadly, still believe it was a good consultation. 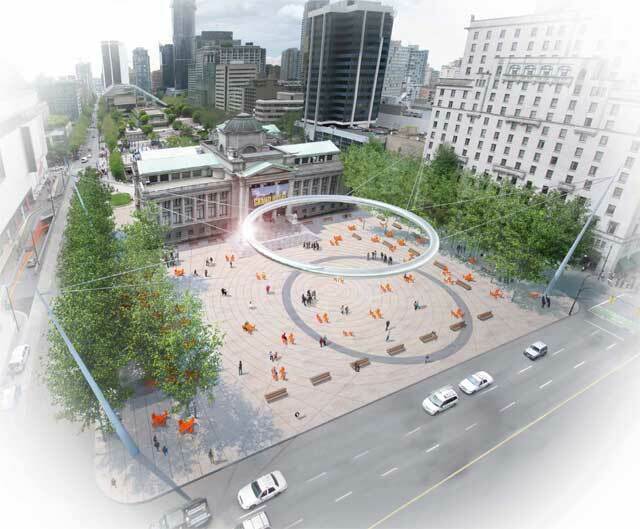 According to a poll by Vancity buzz (3 stunning design revealed for new Vancouver art Gallery North Plaza, Kenneth Chan, VancityBuzz, Oct 1st, 2013), 65& of its polled prefer the “plalo Ring”, while 20% prefer the “wet” concept, with 8% liking the “active edge” one.